To play, you just click a cell. 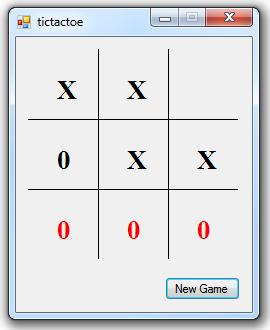 When it is the computer's turn to play, the game grid is strategically assessed and each cell is assigned a priority value according to its strategic value in the game. After rating all of the cells, the computer plays either the highest rated cell, or in the case of jointly rated cells, a random cell chosen from the joint highest rated cells. The used cells will never be chosen in this decision making algorithm as they are always assigned a rating of -1 which will always make them the lowest rated cells. The form code is very simple. Just a Button_Click event is handled. The cell Class is again very simple, just holding 3 member variables. The grid Class inherits from Panel - it is an extended Panel. It holds some Class level variables that are used throughout the Class during game play. Sub new sets the size of the Panel and initializes the matrix array. There are two overridden events handled in the extended Panel Class. These are the MouseClick event and the Paint event. The newGame procedure resets the Class level variables for a new game. The playMove procedure is the AI part of this program, where the computer chooses its move. This returns a Boolean True or False depending on the state of play. Also any winning line is highlighted with red text.